Java 1.5 or greater; 10MB hard disk space. ...... See the performance of all of your investments at a glance with the investment tracking overview. Find ticker symbols with the built-in symbol search. Get free quotes, updated automatically or on-demand. View basic fundamental ratios. Access stocks, mutual funds, ETFs, indexes or currency pairs from most major world exchanges. Keep your investing ideas on your desktop, not on the Internet. 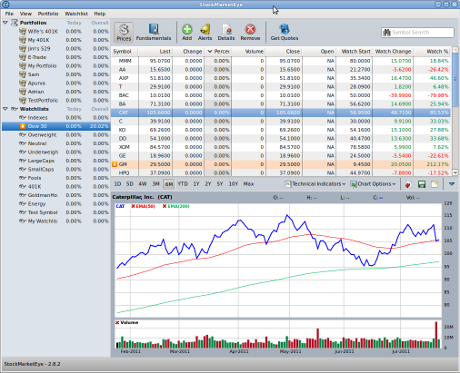 Download StockMarketEye for Linux now for a free, fully functional 30-day trial. Qweas is providing links to StockMarketEye for Linux 2.8.4 as a courtesy, and makes no representations regarding StockMarketEye for Linux or any other applications or any information related thereto. Any questions, complaints or claims regarding this application StockMarketEye for Linux 2.8.4 must be directed to the appropriate software vendor. You may click the publisher link of StockMarketEye for Linux on the top of this page to get more details about the vendor.